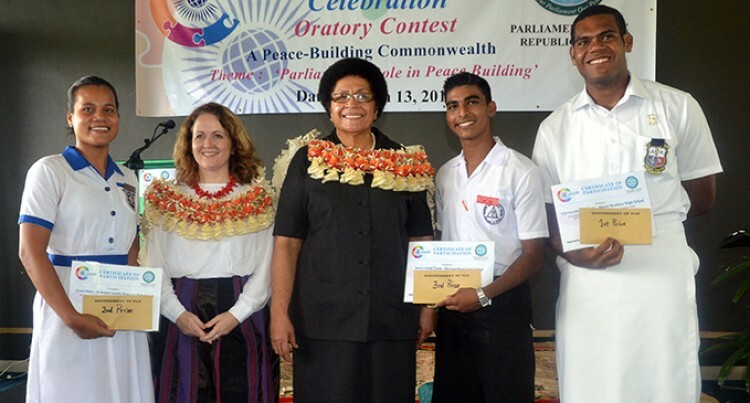 Christopher Minnibi took out the secondary schools Commonwealth Oratory Contest and commended the opportunity youths in Fiji have in voicing their concerns to the Government. “As international students, we are also glad that we get to have a voice here in Fiji,” the Year 12 student of Marist Brothers High School said. He said that youths in Fiji were lucky to have the opportunity to raise their voices compared to his home country, Papua New Guinea. “Although Fiji is the same but the level of activeness is very different,” he said. Year 13 student Grace Malie of Mahatma Ghandi Memorial won second prize while Year 12 student Anish Chand of Bhawani Dayal walked away with the third place. The contest was organised by the Parliament of Fiji secretariat. “The Parliament of today can only do so much but the future is in our hands. I wanted to focus more on the youths and how the Parliament can help us to grow,” Christopher said. His mother hails from Nakasaleka Village in Kadavu while his father is from Western Highlands Province in Papua New Guinea. He moved to Fiji in 2010 and joined MBHS in Year 10. “As international students, we are also glad that we get to have a voice here in Fiji. In Fiji, there is a lot of ways where you can get involved. Although Fiji is the same but the level of activeness is very different,” he said. The technical science student said he joined the contest because his Level Dean at school had asked him to participate since he was good in public speaking.